OBJECTIVES OF THE STUDY: Laparoscopic distal pancreatectomy with splenectomy is now the accepted approach for resection of benign pancreatic body and tail tumors. Interest in spleen-preserving pancreatectomy has grown over the recent years with the intent of preventing post-splenectomy sepsis, as well as other hematologic and immunologic consequences that may occur as a result of splenic resection. Reports of splenic preservation during laparoscopic pancreatectomy are limited, as this technique is much less widespread due to its technical complexity. The aim of this study was to review our experience with laparoscopic spleen-preserving distal pancreatectomy, evaluate the operation’s feasibility and safety, and identify the technical elements that maximize success during this challenging procedure. 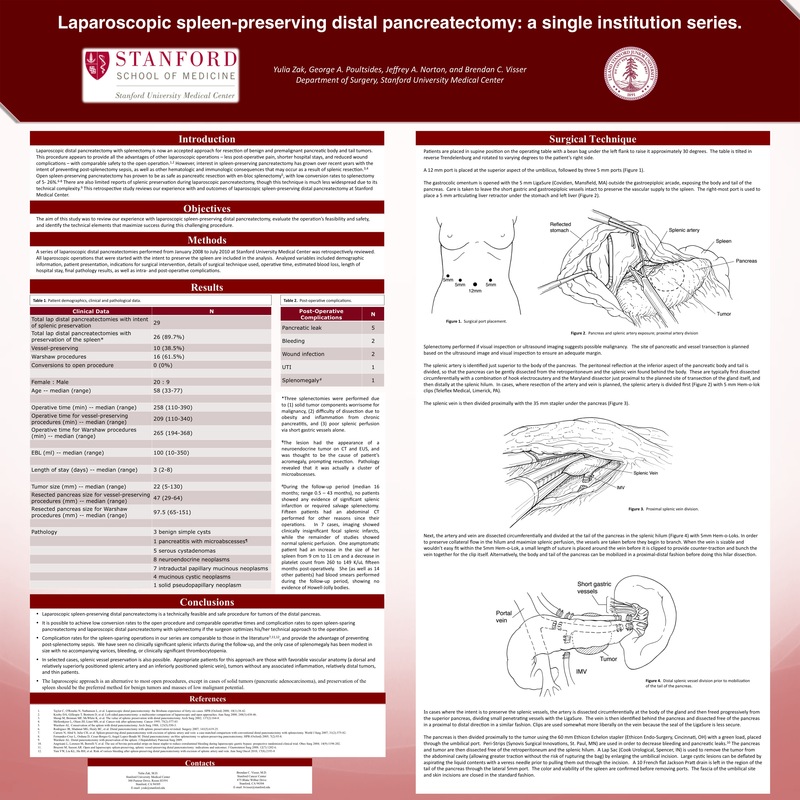 METHODS AND PROCEDURES: A two-surgeon series of laparoscopic distal pancreatectomies at Stanford University Medical Center was retrospectively reviewed. Demographic and clinical patient data were obtained from the electronic patient record. RESULTS: Sixteen laparoscopic distal pancreatectomies were performed from 1/2008 to 7/2010 with the intent of splenic preservation. Thirteen were spleen-preserving procedures (81%). Most of these were performed via the Warshaw technique, with excision of the splenic artery and vein but preservation of the short gastric vessels. Two of the spleen-preserving operations were also vessel-preserving, however (15%). Three splenectomies were performed due to (1) solid tumor components on intraoperative inspection that were worrisome for malignancy, (2) difficulty of dissection because of morbid obesity and inflammation from chronic pancreatitis, and (3) poor perfusion of the spleen via the short gastric vessels alone. All operations were performed with 4 laparoscopic ports (one 12 mm and three 5 mm). There were no conversions to open procedures. Median operative time was 268 minutes [range 177 – 390 min]. Median intraoperative blood loss was 50 ml (10 – 350 ml). Median post-operative hospital stay was 3 days (2 – 8 days). Final histopathologic diagnoses included 11 cystic neoplasms (69%), 4 neuroendocrine tumors (25%), and 1 solid pseudopapillary neoplasm (6%). Median lesion diameter was 26mm (5 – 130 mm). None demonstrated invasive carcinoma. Four patients developed pancreatic fistulas (25%). Two developed a low output fistula controlled by surgical drains. Two patients developed pseudocysts and required endoscopic cyst-gastrostomy. During the follow-up period (median 11 months; range 1 – 22 months), no patients showed any evidence of significant splenic infarction clinically or on CT imaging, and none required salvage splenectomy. CONCLUSIONS: Laparoscopic spleen-preserving distal pancreatectomy is a technically feasible and safe procedure for benign tumors of the distal pancreas. A number of technical steps that facilitate a high rate of operative success have been identified and will be reviewed.